Yesterday, K and I joined Stan Dodson and a small, hearty group to hike from Dimond to Chabot Space and Science Center. Stan is the manager of La Farine Bakery on Fruitvale where we began the hike. But he's also the founder of OaklandTrails.org and the producer of the documentary Trailhead: Discovering Oakland's Gateway to the Redwoods. We were joined on the hike by local historian (and Legendary Local) Dennis Evanosky, who is also part of the documentary. It didn't take long from our start before we were in Dimond Park. There we got our first look at Sausal Creek. A restoration project that was completed earlier this year included daylighting a 180 foot section of the creek that had been culverted for decades. It's made a huge difference in the park, adding both the to visual beauty but also the support for local wildlife. 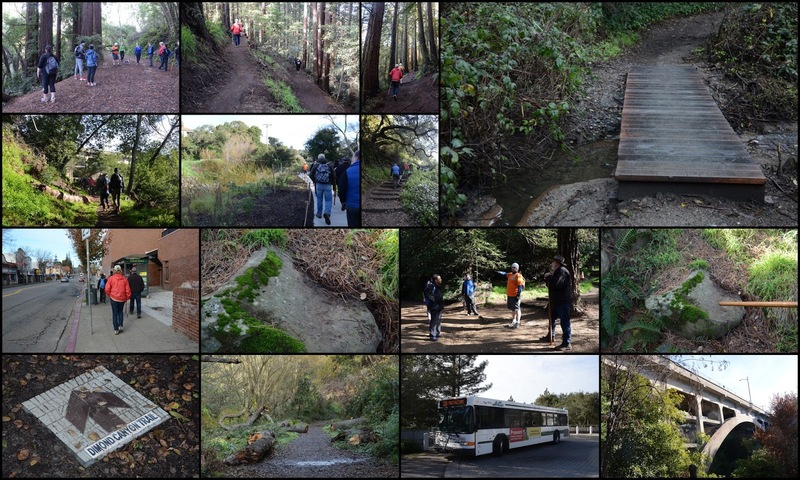 We continued up the Sausal Creek watershed into Dimond Canyon, and saw some of the projects that the OaklandTrails.org volunteers have been involved in. Stan's fundraiser for the Trailhead documentary was so successful that he had some money left to have trail markers made for the route, too. Which is a good thing, as the route takes a few non-obvious turns. We stopped at various points to catch our breath, hear some info from Stan or some history from Dennis, or just admire the views. Even with the stops, we finished the 5.5 mile, 1,500+ foot climb in about 2.5 hours. At Chabot, we hopped on an AC Transit bus for a 10-minute ride back to our start on Fruitvale Ave. It's amazing to have such a beautiful, natural area within the bounds of Oakland, and that can be reached on foot, by transit or by car. From the trails near Chabot, you can connect to hundreds of miles of trails, including the 550-mile Bay Ridge Trail. Stan leads the hikes not just for the general public, but for school groups, after-school programs and others. And OaklandTrails.org does trail maintenance, patrols the parks to help users and looks for fallen trees and other hazards, and works to improve the trails. To donate or volunteer, check out OaklandTrails.org to learn more. You can watch the Trailhead documentary there, too. You don't need to wait for one of Stan's guided hikes, though. Maps are available online, trail markers are there, so get out and explore some of the natural beauty here in Oakland! See the photos full-size here. 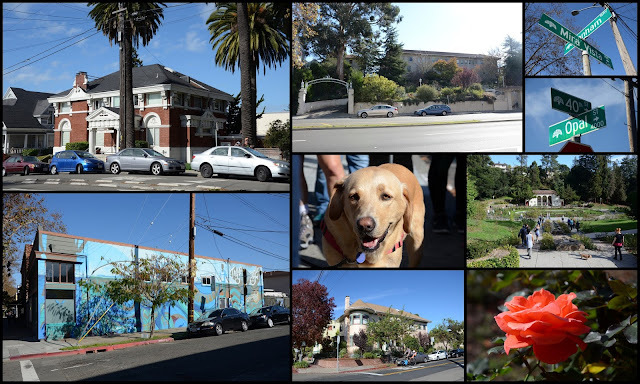 The other Saturday urban planner Ruth Miller led about 50 people (and one dog!) on an Oakland Urban Paths walk exploring some buffers and boundaries in Oakland. We started the walk at MacArthur BART with option return by AC Transit bus, making it easily the most transit-friendly walk we've done. At MacArthur BART we looked at the transit village that's in progress; the BART parking and housing on BART property is completed. From there we meandered above and along 40th Street, talking about transit past (Sacramento Northern Railway, Key System) and present (AC Transit, bike super-sharrow). It was a great walk. Thanks to Ruth for leading us, Charlie for doing his best to keep us safe, and special shout-out for everyone who climbed the hill on Jean Street just so we could go down the stairs on Bonham Way. 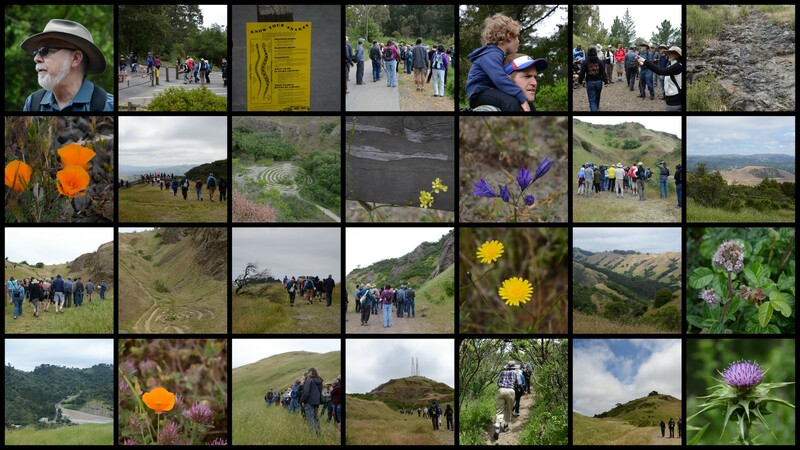 The December walk will be a Rockridge ramble, with lots of stairs. Hope to see you on the paths! 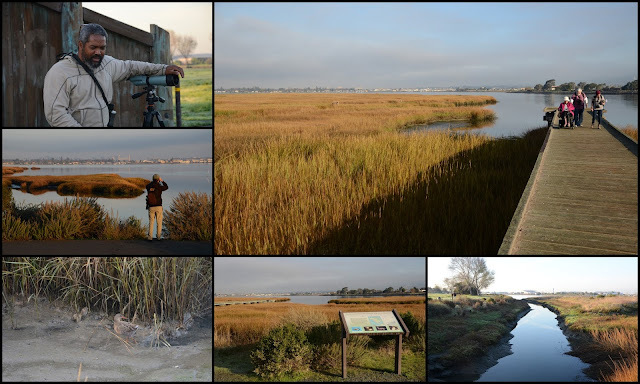 The other weekend K and I went birding at the Martin Luther King, Jr. Shoreline. The walk was advertised as accessible and for beginning birders, and was led by Clay Anderson and others from the California Center for Natural History. We saw a Cooper's hawk, great blue heron, lesser egrets, pelicans, and more. But the thing that got the more experienced birders excited was seeing a Ridgway's rail (formerly known as a clapper rail), a bird which is a near-threatened species. It's also less common to see because of its nature—it spends most of its time in long marsh grass. So you'll hear them more than you'll see them, at least once you recognize the call. Check out more birding walks with the California Center for Natural History and with the Rotary Nature Center at Lake Merritt. More photos from our birding walk. On Saturday, local historian and author Dennis Evanosky led Oakland Urban Paths on a walk exploring the Hayward Fault, as well as some other interesting bits of geology between the Redwood Heights Recreation Center and the Mormon Temple. We're in the early stages of using a registration system to get a better handle on the size of the walks, so instead of 125 people like we had a couple years ago when Dennis last led this walk for us, we were closed to a much more manageable 60 people (and 2 dogs). We started at the rec center, then went past the nearby Redwood Heights Elementary School. Unfortunately, after the school was built, a trace of the fault was found to be very close by. To comply with a state law that wasn't yet in effect regarding the minimum distance between fault lines and schools, they tore down the multi-purpose building and removed part of the main building that was too close. We also looked at a sag pond which is now an EBMUD reservoir, learned about 35th Avenue's role as a way to transport redwoods from the hills down to the harbor, and talked about the Gold Star Streets which were named for locals who died in WWI. Along Rettig, we walked a peaceful stretch of road beside a stretch of Peralta Creek. It's peaceful because a landslide shut off access to the road, and it was decided to keep it closed after the cleanup. After some climbing, we came to the site of the London Road Slide. This slow-moving slide in 1970 destroyed a section of London Road, along with 14 houses, but it could have been a lot more spectuclar because of the jet fuel pipeline that used to run through the area. More climbing took us to the Mormon Temple, where we saw groups from several quinceañeras (a Latina celebration of a girl's 15th birthday) getting their pictures taken, and the beautiful gardens and fountain on the temple grounds. Thanks to Dennis for leading the walk, and to everyone who came out for it. And thank you for your patience as we figure out the registration system. November's walk will be "Buffers and Boundaries," led by Ruth Miller. See the walk calendar for more information, and hope to see you on the paths! See the pictures individually here. That's only the highlights, and there's almost 1/4 of the month to go! Which is all to say, I may not get around to posting about all these events anytime soon... Especially since I have regular, paying work to do, too. We had interesting clouds in the sky on Wednesday, and they made for even more interesting reflections off the Ask.com building. Lots of dead people, and thanks to the rain last week and sun this week, lots of living flowers and grass in St. Mary's Cemetery. No, not that Farmer Joe's. About 1973, Farmer Joe's opened on Lakeshore. It's not related to the two Farmer Joe's on MacArthur and on Fruitvale. Apparently it was run by Joe Sasso, who also had a stand at College and Claremont. Sometime in the 1980s it changed to Lakeshore Produce. The sign was revealed recently when Peet's decided to expand, and Lakeshore Produce had to move up the street, where they are now at 3312 Lakeshore. On Saturday we had an overwhelming turnout for the Oakland Urban Paths walk focused on the Cleveland Heights neighborhood and the nearby former home of "Borax" Smith. 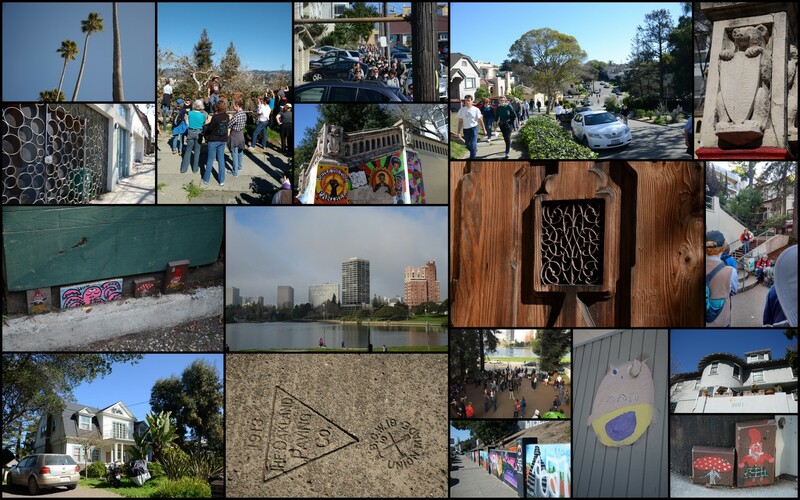 A record 132 people enjoyed the unseasonably warm weather to learn about this part of Oakland. We started at the Cleveland Cascade, a water feature on the shores of Lake Merritt, built in 1923. It fell into disrepair, but a group of neighbors has cleaned it up and is raising money to restore it. Keeping our eyes out for gnomes, we wound our way around to the middle of the Haddon Hill neighborhood. It started as an exclusive development in 1912 by Wickham Havens, son of Frank C. Havens. We had a longer stop at 552 Montclair Avenue. This c.1897 Victorian was built for Judge Edward C. Robinson and his family, including son Bestor Robinson who was law partners with Earl Warren and led the Sierra Club for many years. The house has lots its "witches hat" and been divided into apartments, and the tankhouse has lost its tank and windmill, but it's still a spectacular property. Our path took us past the Park Community Garden (the artwork I mentioned, "Her Resilience", has been moved indoors for the rainy season) and a couple of murals, including one by Peter Lee. After walking past several beautiful apartment buildings that date back to the 1920s and 1930s, we stopped to talk about "Borax" Smith. Francis Marion Smith, known as Frank to his friends, and to his consternation, "Borax" Smith to the rest of the world, was a legendary local of Oakland. After making a fortune in borax (used as a cleanser), he invested in Oakland. He was the force behind the creation of the Key System street cars; the Realty Syndicate (where he partnered with Frank C. Havens) developed areas of Oakland and built the Claremont Hotel. His estate was called Arbor Villa; the row of tall palm trees on 9th Avenue marked one edge of the estate. While the grounds and the magnificent Oak Hall were being constructed, Frank and his wife Mary moved into the "old red house" (currently painted green) nearby. The Smiths entertained and hosted fundraising events in a grand style: "The most brilliant affair of the week of course was the reception which Mr. and Mrs. F. M. Smith gave on Wednesday evening at their charming home, Arbor Villa, in East Oakland, to which over 1300 guests from both sides of the bay were bidden." (April 23, 1899 San Francisco Call). Mary R. Smith was inspired by reading Benjamin Farjeon's Blade O' Grass about orphans in London, and the Smiths took in a number of young girls. Frank gave her some land nearby, and they set up a trust. The Mary Smith Home for Friendless Girls became home to numerous orphaned girls. The girls lived in cottages, each run by a house mother; the older girls helped take of the younger girls. Many of the cottages, including one designed by Julia Morgan, still stand. 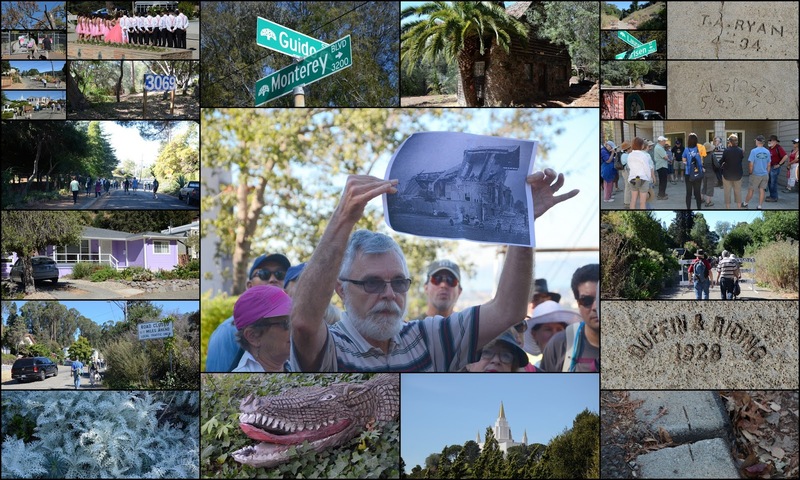 Our final big stop was across from the Haddon Hill home of industrialist Henry J. Kaiser. We also looked at some former steps that used to go from the end of Haddon Rd. down to MacArthur Blvd. Those are closed off, and the statue that graced the plinth is long gone. Thanks to everyone who came out for the walk! The regular second Saturday walk for March 12th hasn't been set yet, but there will be a special walk on Saturday, March 19th, focused on women's history. Check the website calendar for more info, and hope to see you on the paths! More photos from the walk here. Yesterday, K and I toured some of the galleries taking part in the Saturday Art Stroll, the quieter alternative to First Fridays. We talked with artist John W. Wood for a while (we've seen his artwork before, at Gray Loft Gallery in Jingletown), and he showed us a few of the tools he uses to create his art. On Saturday, about 70 people and 5 dogs joined Oakland Urban Paths for a walk exploring the former town of Brooklyn, east of Lake Merritt. There were overcast skies, but we managed to get a break in the (much-needed) rain. Last year local historian Robert Perricone led this walk for OUP, but we changed things up a little this year. The town of Brooklyn was formed in 1856 by the merger of two smaller settlements, Clinton and San Antonio, and later annexed the town of Lynn just to the north. It was named for the ship Brooklyn which brought Mormon settlers to California in 1846. County supervisor Thomas Eagar suggested the name; he'd been a passenger on the Brooklyn. The town didn't last too long; in 1872, voters approved annexation by Oakland. But it's worth noting that most all of what is now Oakland that wasn't already part of Oakland or the town of Brooklyn was called Brooklyn Township, so an older location name might refer to either. Next to Clinton Square Park where we met had been the home of Hiram Tubbs, who made his fortune in making rope, and was one of the founders of Mountain View Cemetery. A house built for one of his daughters and son-in-law, the Tubbs-Henshaw House, still stands across International Blvd. Locally, Tubbs was best known for building the palatial Tubbs Hotel, which filled the next block over. Gertrude Stein lived there with her family when they first moved to Oakland. Writer Robert Louis Stevenson stayed there. "Borax" Smith met his first wife Mary at a dance at the Tubbs Hotel (February's walk will be about Cleveland Heights and the former Borax Smith estate.) Unfortunately, the building burned in 1893. The fire department didn't have enough water to fight the huge fire, so all they could do was join the crowd of onlookers and watch the spectacle. Stein left Oakland in 1891 after her parents died, and didn't return until 1935. During that time, the Tubbs Hotel burned down, the family house was torn down, Oakland's population increased from 35,000 to nearly 300,000, and the bucolic neighborhood where the family had lived was now full of apartment buildings and nearby Highland Hospital. The Oakland of her childhood was gone, and you can't go home again—that's what she meant by "there's no there there". We stopped and talked about lots of places, some dating back to when it was the town of Brooklyn, and some more recent. One place where we all learned something new as the Vue du Lac Apartments at the corner of Foothill and 3rd Avenue. The building was constructed in 1906 by Charles MacGregor, known as "the builder of Albany" where he constructed about 1,500 homes over the years. He was also called "One-Nail MacGregor", either in a jab at his being overly thrifty, or (more likely) a compliment at the quality of his buildings. At the Ellen Kenna House, a spectacular Victorian that Ellen Kenna had built in 1888, there were questions about the front door, or more to the point, what appeared to be the lack of one. According to the current owner, "Ellen Kenna owned the block from 12th to 13th Ave. The Valentine Mansion across the street was also situated with its front facing 13th. After Ellen died and it became a hospital, several small homes were built for the staff on the 13th Avenue side (the front). These, too, were eventually subdivided and the stairs coming from the front were awkwardly redirected towards East 21st Street." Alas, he has to sell the home, so while tons of restoration work have restored much of the former glory of the home, he won't have time for the rest of the changes. Get out and explore on your own! 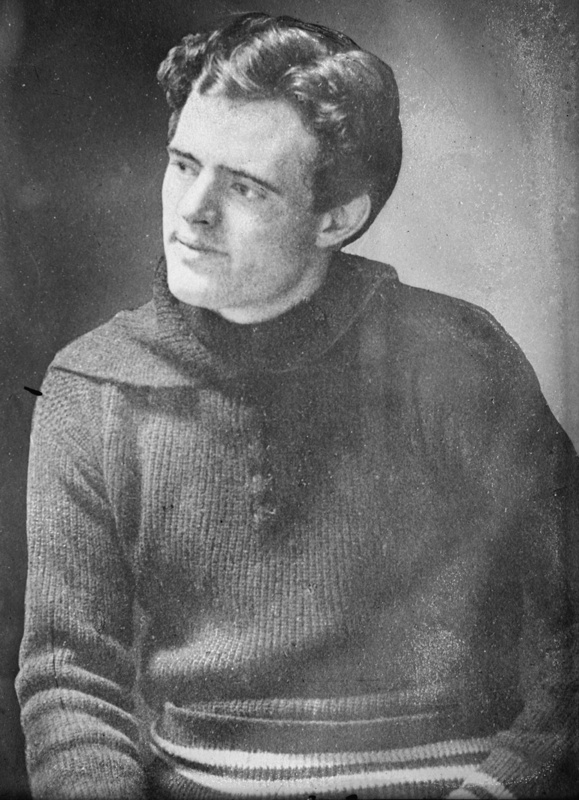 You can also join us on Saturday, January 23rd, for a special walk about author Jack London. Our regular walk on February, 13th, will focus on Cleveland Heights and the former "Borax" Smith estate in Ivy Hill. It's been a while since I did a post about a cool Oakland sign. OK, it's been a while since I did any post. I dropped K off at MacArthur BART today, and the weather was glorious. We were in a rush to make sure she got her scheduled train, but that didn't stop me from noticing how amazing Marcus Books and the murals on the outside looked in the break in the weather. So after I dropped her off, I swung around and took some pictures of the sign, building and murals.